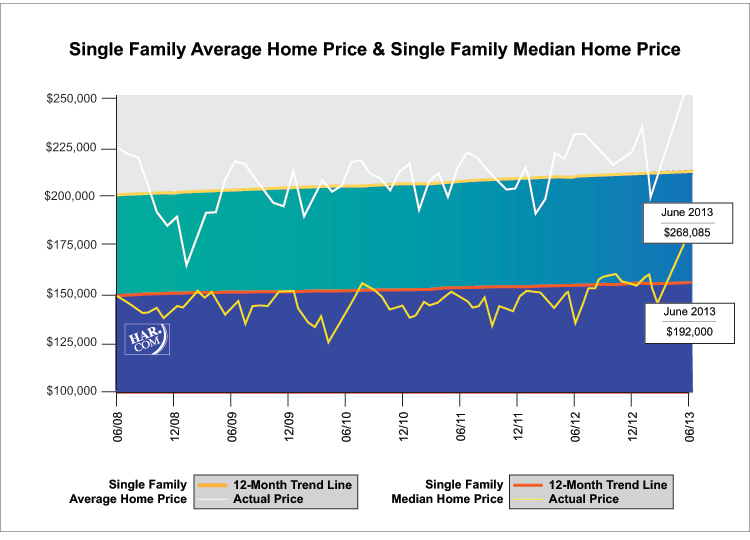 HOUSTON — (July 16, 2013) — In a report that is beginning to sound like a broken record, Houston home sales were up for another month in June, with demand sending prices to all-time highs. June was the 25th consecutive month that sales held to positive territory, but for the first time since February, the supply of available homes leveled off. Home sales jumped 13.4 percent year-over-year, with contracts closing on 7,220 single-family homes, according to the latest monthly report prepared by the Houston Association of REALTORS® (HAR). That is the second highest one-month sales volume of the year and the third highest one-month volume of all time. Housing inventory remained unchanged from the 3.3-month supply recorded in May, however it is down from 5.5 months of supply in June 2012 and 3.6 months of supply at the beginning of 2013. The median price of a single-family homethe figure at which half the homes sold for more and half for lessrose 12.9 percent to $192,000. The average price increased 13.8 percent year-over-year to $268,085. Both represent the highest prices ever recorded. All housing segments experienced gains in June except for those priced under $80,000. Homes selling between $250,000 and $1 million and above registered the greatest increase in sales volume. Houstons home buying blitz continued despite rising mortgage interest rates and a slight cooling in employment growth. The Texas Workforce Commission reported that the greater Houston area added 91,600 jobs in the 12 months ending May 2013, which is down from 106,000 jobs and a 4.0 percent annualized rate for the 12 months ending April 2013. Foreclosure property sales reported in the HAR Multiple Listing Service (MLS) declined 45.0 percent compared to June 2012. Foreclosures currently make up 8.4 percent of all property sales, down from 9.4 percent one month earlier and 19.6 percent at the beginning of the year. The median price of foreclosures rose 15.3 percent to $90,200. June sales of all property types in Houston totaled 8,614, a 14.5 percent increase over the same month last year. That marked the second greatest one-month sales volume of the year. Total dollar volume for properties sold jumped 28.5 percent to $2.2 billion versus $1.7 billion a year earlier. June brought more positive results to the Houstons real estate market when comparing all sales categories to June of 2012. On a year-over-year basis, total property sales, total dollar volume and average and median pricing were all up. Month-end pending sales totaled 4,416, an 8.0 percent gain over last year and a strong indicator of another increase in sales when the July figures are tallied. Active listings, or the number of available properties, at the end of June declined 23.0 percent from June 2012 to 32,518. After kicking off 2013 with housing inventory levels at 3.6 months, with incremental declines throughout the spring, inventory held unchanged in June from the 3.3-month level it reached in May. For perspective, the inventory of single-family homes across the United States stands at 5.1 months, according to the latest report from the National Association of REALTORS® (NAR). June sales of single-family homes in Houston totaled 7,220, up 13.4 percent from June 2012. That marks the 25th consecutive monthly increase as well as the second largest one-month sales volume of 2013 and the third of all time (the largest was in June 2006). Home prices climbed to record highs during the month. The single-family median price rose 12.9 percent from last year to $192,000 and the average price climbed 13.8 percent year-over-year to $268,085. 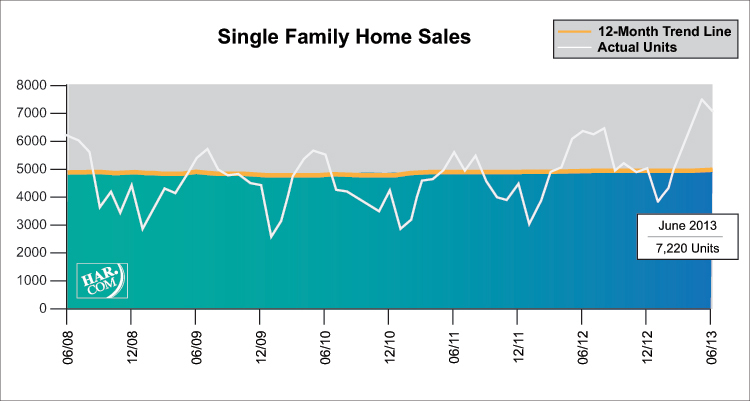 HAR also breaks out the sales performance of existing single-family homes throughout the Houston market. In June 2013, existing home sales totaled 6,352, a 16.3 percent hike from the same month last year. The average sales price rose 13.2 percent year-over-year to $256,160 while the median sales price jumped 12.6 percent to $182,000. June sales of townhouses and condominiums increased 10.2 percent from one year earlier. A total of 604 units sold last month compared to 548 properties in June 2012. The average price climbed 10.3 percent to $198,004 while the median price rose 8.8 percent to $148,000. Months inventory was 3.4 months versus the 6.3 months level recorded in June 2012. Houstons lease property market had a mixed performance in June. Rentals of single-family homes edged up 2.2 percent compared to June 2012 and year-over-year townhouse/condominium rentals dipped 3.5 percent. At $1,707, the average rent for single-family lease homes reached the highest price of all time. The average rent for townhouses/condominiums climbed to its highest price ever at $1,498. Sales of townhouses/condominiums rose 10.2 percent year-over-year. Rents for single-family homes and townhouse/condominium units reached record highs.